Kasumigajo Park in Nihonmatsu City, Fukushima Prefecture was built on the site of Nihonmatsu Castle (also known as “Kasumigajo Castle”), a castle associated with several tragic stories, including the death in battle of the young soldiers of the “Nihonmatsu Youth Corps” when the castle was captured after a fierce battle in the Boshin War (1868–1869) in the process of Meiji Restoration. As a whole, Kasumigajo Castle Park is full of some 4500 cherry blossoms, including somei yoshino and yamazakura, and the cherry blossoms covering the entire fort seem to be just a haze, as the name suggests. The scenery that makes use of nature is relaxing the hearts of people visiting every season. Kasumigajo Castle is another name, formally Nihonmatsujo Castle. It is one of the 100 most famous castles in Japan, and one of the top 100 cherry blossom spots in Japan. In the glorious light, it is the “Sannomaru stone wall” in the foot of the mountain that jumps into the eyes. 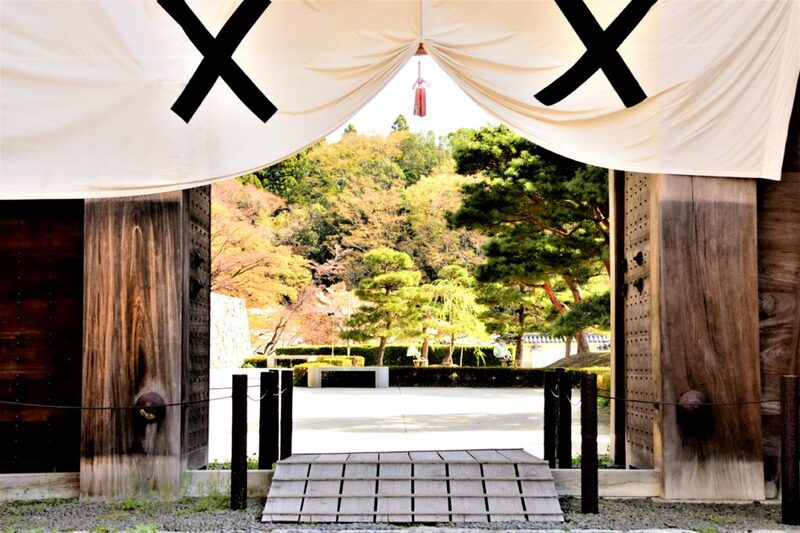 It is believed that it was built in the era of Aizu lord Kato. Among the cherry blossoms in full bloom, the flag of Nihonmatsu-domain in the wind, and the pines with annual rings on the side of the stone steps form a line, and the time goes back from the present to the Edo period. From “Senshintei” where you climb a stairway, you can see the cherry blossoms coloring the walls, the contrail drawn in the blue sky and dramatic sights. You will be fascinated by the wonderful red pine on the way. This old pine, said to be over 300 years old, is called "Umbrella pine" because of the appearance of a beautiful pine that just spread out an umbrella. If you continue climbing further, you will finally reach Ishigaki(Stone wall) of the Honmaru trace. Restoration work of Heisei 5-7 years, and further restoration work of East Japan Earthquake of 2011 are carried out, and there is a castle tower and Ishigaki which is being revived as a symbol of a castle today. I draw in the heart of Nihonmatsu castle which fell in the Boshin war. Climb the Castle Tower for a 360 ° view, the Shiroyama Excursion Road is followed by a cherry tunnel, and Adatara mountaion covered with remaining snow looks behind the Solitary pine tree, providing a wonderful view. There was a beautiful space surrounded by cherry blossoms from the gaps of trees along the way after getting off the main circle, and the relief stood there. It was a relief that made the boy squadron struggling during the Boshin war. Speaking of the boy squadron of Boshin war, the group self-determination of the white tiger squad of Aizuwakamatsu comes to mind, but the abduction of the lesser known Nihonmatsu Shonentai was also a tragic thing. As the force of the Nihonmatsu domain is around 2000, and the number is also given to the Shirakawa castle battle, there is not enough force before the approach of the new government army. The leader was forced to admit the mobilization of boys aged 12 to 17 years. Of course, it is not something that the upper management has decided by himself, but the boy in charge has made a tough decision after the juveniles who knew the war situation repeatedly put out a plea for deception. The boys, later called the Nihonmatsu Shonentai, counted 62 people. The boys' team struggled with a sword longer than their own, but they fell one after another into new government army bullets. The 16 boys who died at this time are quietly sleeping in Dairinji temple, a familiy temple of the Niwa family. This beautiful dreamy square was the site where the boys were practicing artillery until just before the Boshin war. There was not the misery of the war, but the brave feelings of the children who were just trying to protect them. The hills of the boys corps. There were countless hydrangea in the right alley at the entrance. The warm hydrangea flowers will keep you in touch with those who visit in June, when the rain continues like the unstoppable tears. Tohoku cherry blossoms are beautiful! Heal the heart and give tomorrow's power "Miharu Takizakura"